Join us for a Family Friendly Climate Fest & Outdoor Film Screening! Stop Climate Chaos, of which Friends of the Earth is a member, will collaborate with Happenings to host 'Dinner with Darwin' on July 22nd! With yoga, delicious food, a Climate Fest, a speakers panel and a movie, there's something for everyone. We've done it! Huge thanks to everyone involved. On Thursday 6th July 2017, President Higgins signed the Bill to legally ban fracking in Ireland into law. The new law now makes it illegal for any one to look for or extract petroleum from Ireland's onshore. The success of this campaign is down to the power of people working together to achieve a common goal. From the committed groups across Leitrim, to everyone who contacted their local TD, to those who signed our 11,000+ strong petition, those who showed up in the Dail and Seanad over the last few months, and those who held banners on the streets! Everyone had a role to play. Only together can we take on Government, and win! Do you want to help Friends of the Earth blossom at Bloom? educating them about the need to create chemical-free food, shelter and nesting spots for beneficial insects in their gardens. Bee-friendly and win tickets to Bloom! With bees in trouble worldwide, bee-friendly gardening can play a vital role in supporting these essential pollinators. That’s why Friends of the Earth plans to create a nature garden at Ireland’s largest family, food and gardening festival, Bloom in the Park from June 1-5, but we need your help to make it happen! We’ve partnered with 2016 RTE SuperGarden finalist and permaculture expert, Suzie Cahn, to propose a nature-friendly ‘postcard garden’ at Bloom called The Bright Side of Life. Our nature education garden would showcase how you provide food, shelter and nesting places for important pollinators like bees and other insects. According to the most recent SEAI energy data report (2015), in line with the recovery from the aftermath of the economic crash, 2015 saw the first year of an increase in energy use in Ireland since 2009. Given this fact, the SEAI Energy Show offered the chance to see where Ireland currently stands on our energy consumption, greenhouse emissions and the mitigation of this impact through renewable energy project roll-outs and innovationsin green technologies. 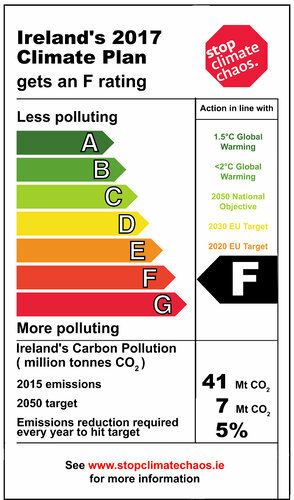 If Minister Naughten's draft climate plan was a fridge-freezer it would get an F-rating. Click here to tell him we want a new plan that we can be proud of. After 6 years Enda Kenny's Government has finally published a draft climate plan. But it's so awful it's embarrassing. In the face of the greatest threat humanity faces Ireland is looking for a free ride. It's not really a plan at all, it reads like a discussion document. And it doesn't actually adopt any new actions to reduce Ireland's emissions. Our political leaders are putting vested interests ahead of the public interest. And they are counting on the public not paying attention. We want your help to prove them wrong.